The Bulldogs of Georgia swept the Yellow Jackets of Georgia Tech in an early-week dual meet on Tuesday. Taylor Weiss from Stingrays Swimming in Georgia verbally commits to Arkansas. FGCU Uses Depth To Beat Miami, 175-123. New Miami Head Coach Andy Kershaw falls to fellow Florida team, FGCU, for the fourth time in school history Saturday afternoon. (Photo Credit: SMU). 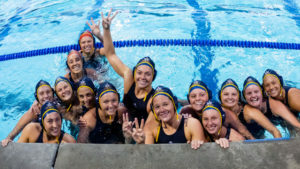 In both teams season opener, the Tennessee Volunteers defeated the UNCW Seahawks at Seahawk Natatorium.